Part of the Taschen Basic Art series. 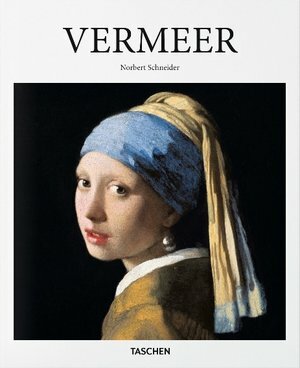 Though numbering just 35 known works, the oeuvre of Johannes Vermeer (1632—1675) is hailed as one of the most important and inspiring portfolios in art history. His paintings have prompted a New York Times bestseller, a film starring Scarlett Johansson, and record visitor numbers at art institutions from Amsterdam to Washington. Vermeer’s subjects focus on daily domestic activities, from letter writing to music playing to preparations in the kitchen. The scenes astound with their meticulous detail, majestic planes of light, and with Vermeer’s extraordinary ability to draw out narrative intrigues. In such beloved paintings as Lady Standing at a Virginal, A Lady Writing a Letter with Her Maid and, most famously, the enigmatic, wide-eyed, and enchanting Girl with a Pearl Earring, Vermeer evokes not only the effects of substance and texture, but also the many stories and secrets that reside beneath the surface. Featuring all Vermeer’s known works and succinct, accessible texts, this essential introduction explores Vermeer’s leading place in art history and his unique ability to transform oil paint into a living, breathing scene of human life.